You’ve heard people talking about getting into ketosis, but what exactly is ketosis and is it truly safe for us? These are all questions I had before I started on this journey, like most people, I had actually never heard of the term ketosis. So what exactly is it? Ketosis is a natural state that the body goes into when it runs out of carbohydrates (glucose) for fuel. Normally, glucose is used by our cells as a quick source of energy that continually needs to be replenished for us to have energy. When our body runs out of glucose it begins to switch over to its “reserve tanks” for a cleaner, longer lasting, higher energy fuel source it gets by breaking down fat cells and converting them into ketones. As your body continues to break down fat cells converting them into ketones your blood ketone level will start to rise. 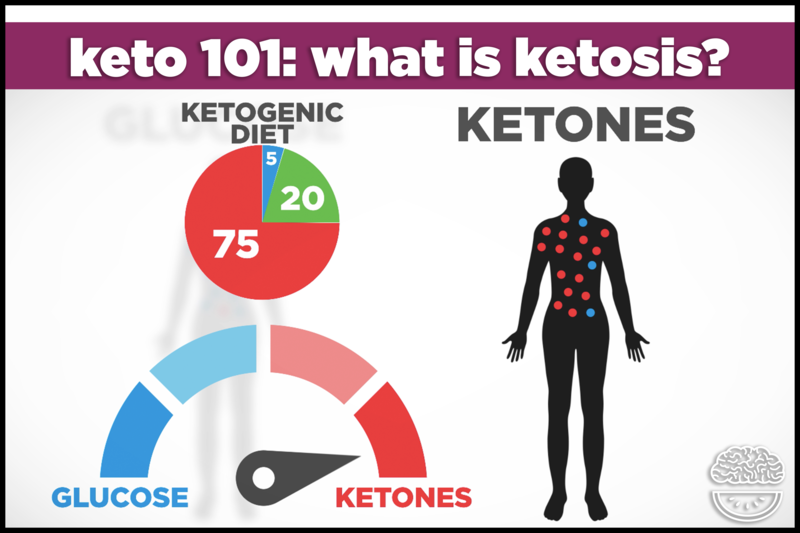 Being in a state of ketosis is defined when your blood ketone levels reach 0.5-3 nM. We will delve into measuring blood ketone levels in a later blog post. Achieving a state of ketosis can take some work and planning ahead. It’s not just as simple as cutting carbs. Below are 9 helpful tips to get into ketosis. Sticking to a low-carb diet is one of the most important factors to achieve ketosis and maintain it. The amount of carbs alloted is indivually based, although the average recommended amount is 20 grams of net carbs (total carbs minus fiber) a day. How your body adapts is important to note and while some people need to maintain 20 grams others can intake 50 grams and still be in ketosis. Don’t fall for what we call “the Big Fat Lie”. It is a common misconception that eating fat makes you fat. It is a lie that the food industry created to make a big profit with low fat/reduced fat marketing to appeal to the masses. Fat makes up a very large percentage of the keto diet but not just any fats. It is important to eat the right kind of healthy fats to ensure success. If the goal is ketosis, you must increase your intake of healthy fats. Your body naturally produces ketones endogenously (or inside the body) but did you know you can drink exogenous ketones (outside the body). Exogenous ketones induce a state of ketosis within an hour of drinking them. This is a brand new technology that was only developed in 2012. It was discovered by Scientists out of the University of South Florida who were doing research for the DOD and NASA. Where as previously the only way to raise blood ketone levels was to fast for several days or go on a very strict ketogenic diet. Although most people were never able to cross fully into ketosis, now with the aid of a drinkable version of ketones anyone can experience what it feels like to be in ketosis without having to be perfect or fast. Could exogenous ketones be the fourth macronutrient? Now consumers are able to ingest ketones which provides another sustainable energy source to the body. Continuous research into this energy source points to exogenous ketones possibly being a fourth macronutrient. Ketones are “energy containing molecules”- Dr. Dominic D. Agostino, PH.D.
Fasting will offer great benefits to you. Choosing not to eat for an extended period of time gives the body a reset, allowing you to experience major health benefits. Your body will flush out toxins and as a result, increase metabolism. In doing so, it will help your body jumpstart into the ketogenic state and allow you to maintain it for a longer period of time. Intermittent Fasting is a powerful healing and weight loss tool that will elevate blood ketone levels and keep you in ketosis. Macronutrients are Protein, Fats, and Carbs. Each Macronutrient should account for a percentage of your daily caloric intake. Each individual is different and macro consumption may vary. A sure fire way to get and stay in ketosis is to check your ketone levels and adjust your macros according to your levels. There are a few options in order to do so. You can check ketones by urine test strips, ketone blood meters, or through a ketone breath meter. The most accurate way to test is through the ketone blood meter, however, the other options will do the trick. Check out more info on methods to test blood ketone levels. The ketogenic diet is based on high fat, moderate protein, and low carb intake. We have discussed healthy fats but let’s talk about moderate protein. Eating too much protein can kick you out of ketosis while having too little protein intake could cause muscle loss and the feeling of still being hungry. If you eat enough protein you will feel satisfied and eat less. However, finding a balance is key if the goal is ketosis. If you are physically active, protein is important for building muscle and preserving it. How much protein you should be consuming is based on activity level and body weight. Excessive protein consumption converts to glycogen, making it difficult to get into ketosis. Here is a great keto calculator to determine your keto diet needs. Medium chain triglycerides are a type of fatty acid that are found in coconut and palm oils. Mct’s have the ability to regulate blood sugar and aide the body in ketone production. They are great for weight management and increasing cognitive function. They are also more easily digested than long chain triglycerides. When introducing them into your new lifestyle, start with a small amount and build up to avoid stomach upset. MCT’s are an essential source of healthy fat on the keto diet. They are not metabolized through digestion like most other foods, instead they are sent to the liver to be processed and can improve the bodies metabolism. The body utilizes these oils and burns them for a cleaner energy source instead of storing them as fat. Movement is so important. Many folks find they hit a stall in their weight loss, exercise can help you to get over the hump. Being more physically active can help you get into ketosis. Exercising depletes your body of stored glycogen. Normally glycogen stores are replenished when you eat carbs, which are broken down into glucose and then converted to glycogen. However, if you are consuming very little carbs, glycogen stores continue to remain low. In return, your liver starts to increase production of more ketones, which can be used as an alternate fuel source. Many of us eat out of habit. Recognize when your body is actually hungry and only eat when you are hungry. Oftentimes, people mistake thirst for hunger. Sometimes just increasing your water intake instead of eating will satisfy your body. Eat out of necessity and not every time you feel like going to the pantry. This will allow you to stay on track and maintain ketosis.